By Dan Ambrose: According to the latest boxing news rumors, unbeaten WBC welterweight champion Floyd Mayweather Jr. (42-0, 26 KO’s) will fight recently badly injured lightweight Roberto Guerrero (29-1-1, 18 KO’s) instead of the arguably much tougher, stronger and popular WBC junior middleweight champion Saul Alvarez. The choices for Mayweather are down to two of Golden Boy Promotion’s Mexican fighters Guerrero and Alvarez, as Mayweather wants to take advantage of the Cinco de Mayor Mexican holiday on May 5th. It’s unclear why Mayweather would decide on Guerrero rather than Alvarez, but it may be due to the money. Guerrero won’t ask for nearly as much money as Alvarez. Moreover, Guerrero isn’t nearly the same threat as Alvarez either. Guerrero recently suffered a potentially career-ending torn left rotator cut injury that required surgery late last year. Guerrero still hasn’t fought since and there are questions whether he’ll be the same fighter. If Mayweather is looking for a lesser threat to him, then Guerrero is clearly a notch below Alvarez, especially with the questionable left shoulder. But beyond that, Guerrero is a lightweight and fights two divisions below Mayweather. That’s like heavyweight Wladimir Klitschko asking a light heavyweight move up in weight to fight him. Guerrero doesn’t stand a chance against Mayweather, and it’s doubtful that he’ll draw a lot of Mexican fans either because he’s not well known. For me, Guerrero being the smaller guy isn’t the real issue. I’m more concerned with the injury. Any fighter that suffers a torn rotator cuff has a strong possibility that they won’t be the same after the surgery. Guerrero may end up being a one-armed fighter and even a Guerrero with two good arms is going to be out of his class against someone like Mayweather. 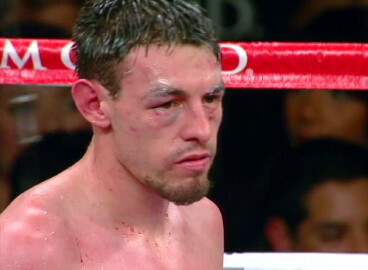 Guerrero got handled several years ago by Orlando Salido, and he’s not faced a real threat since then. An injury like that requires a long rehabilitation period followed by tune-up bouts. Mayweather is really looking for a soft touch to fight Guerrero coming off of this kind of injury. That’s like Miguel Cotto fighting Antonio Margarito after Margarito had three separate eye surgeries. It’s a fight that shouldn’t have happened right away, yet it did due to the rush of the promoter Bob Arum in putting it together.